'4K' is one of the most overused tech buzzwords of 2014 for the display market, with its usage set to increase as so-called 4K displays proliferate in availability and come down to more accessible price-points. While 4K itself is defined as a resolution with more than 4,000 pixels in horizontal resolution, it is commonly used to refer to the UHD resolution of 3,840 x 2,160, which is 'technically' incorrect. However, in-line with convention and widespread adoption, notably in the TV industry where the word 4K has significant purchase, UHD is now understood as interchangeable with 4K. Many of the largest display vendors in the market have already released several iterations of UHD displays to the point where the technology is classifiable as mature. The initial launch of UHD monitors typically came in one of two flavours. 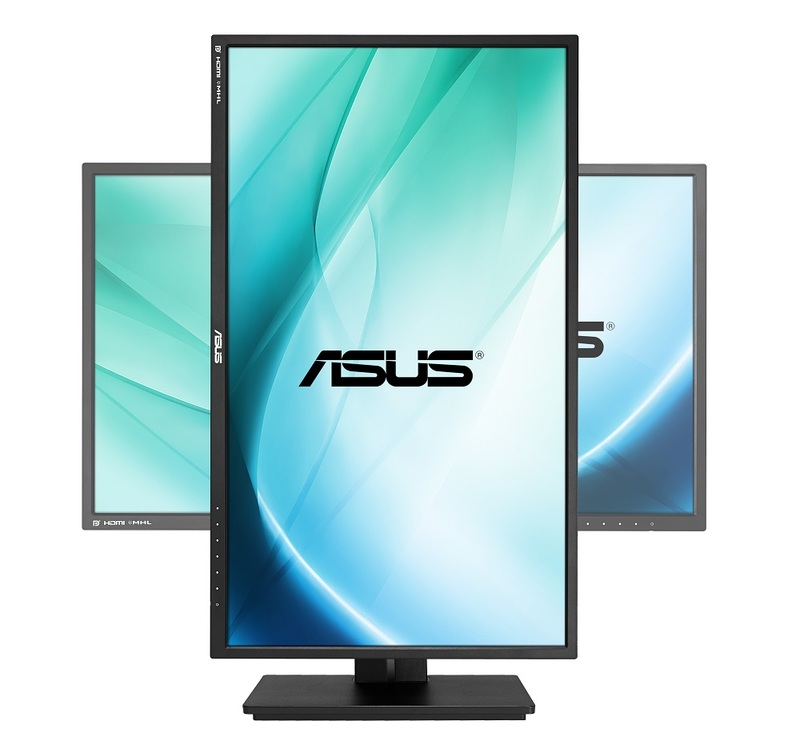 The first delivered 60Hz through the stitching of two 1,920 x 2,160 panels together in one display, and the second displayed the full UHD resolution at a reduced 30Hz. 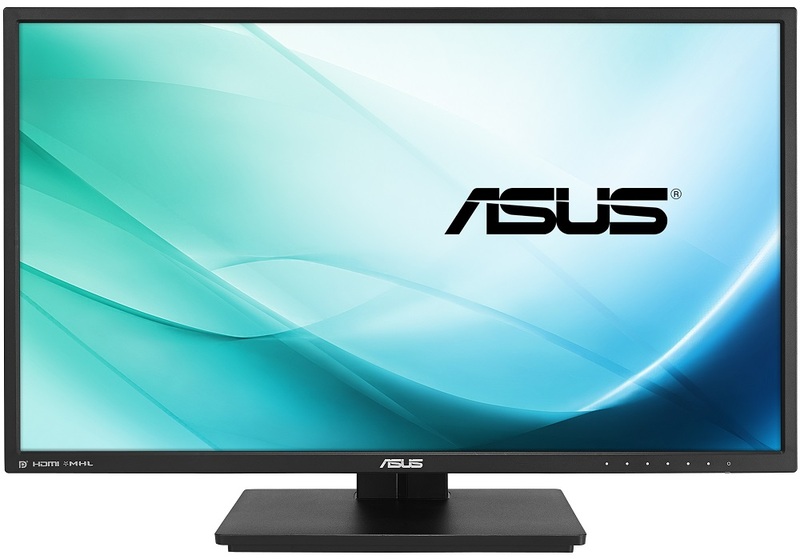 Now the market has progressed to single-panel designs that can operate at 60Hz without an issue, and with the flexibility of choosing DisplayPort 1.2 or dual HDMI 1.4 as the input streams. We're also starting to witness differentiation among UHD displays; the number of available panel types is multiplying and vendors are starting to focus more on adding features into these UHD displays rather than simplying relying on the fact they are '4K ready' as the primary feature and selling point. Today's review focuses on one of the latest mature and feature-packed UHD displays to hit the market; the ASUS PB279Q. 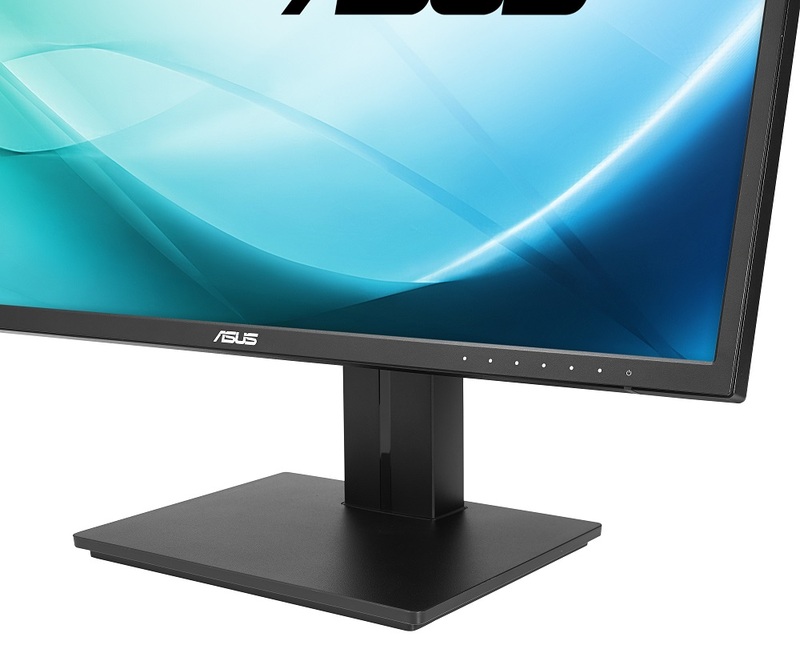 Making use of a WLED backlight and an AHVA IPS panel, the ASUS PB279Q boasts a wide colour gamut and 178-degree viewing angles that TN-based UHD monitors can only be in awe of. On the feature-side there's a substantial array of different connectivity options available, built-in speakers, Picture-in-Picture (PiP) and Picture-by-Picture (PbP) operating modes. A fully-featured stand with all the desirable adjustments is also present. 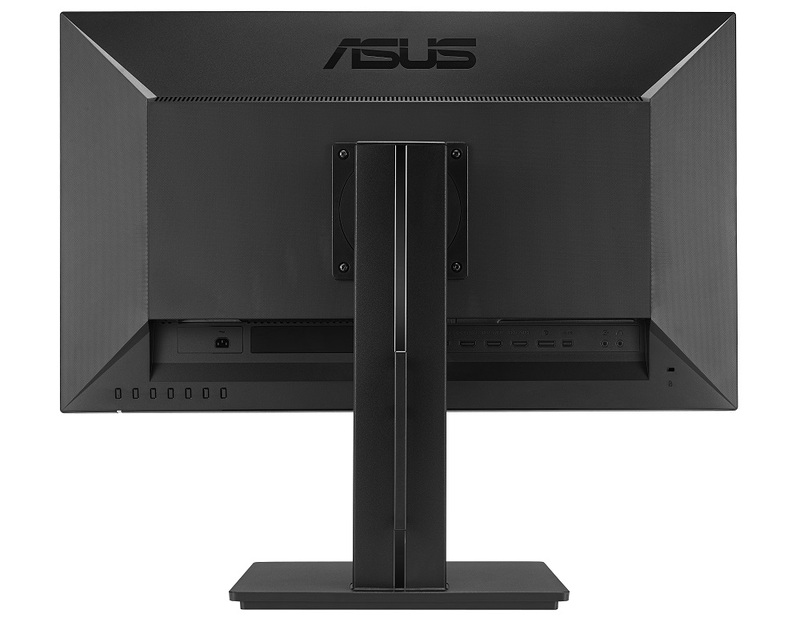 The ASUS PB279Q has a striking design thanks to its slim 1cm bezel, that tapers down towards the panel, and thin overall profile. Functionality is assisted by the stand which has height, pivot, swivel and tilt adjustment options paired with a sturdy base. Along the lower-bezel, white-spots indicate placement of the rear-mounted tactile OSD and power buttons; a nice alternative to the finickity touch buttons normally found on displays to control the OSD. Connectivity is surprisingly abundant as ASUS provides one DisplayPort 1.2, one mini-DisplayPort 1.2, four HDMI 1.2 ports that also double as MHL 2.0 ports and 3.5mm audio in and out jacks. A standard kettle lead input deals with the monitor's power requirements. The justification for the large number HDMI/MHL connectors is to support up to four simultaneous input streams when using picture by picture (PbP) mode. Despite the fact the PB279Q sports an integrated power supply and 100mm x 100mm VESA mount the profile is very thin; measuring six centimeters at the thickest point excluding the stand. 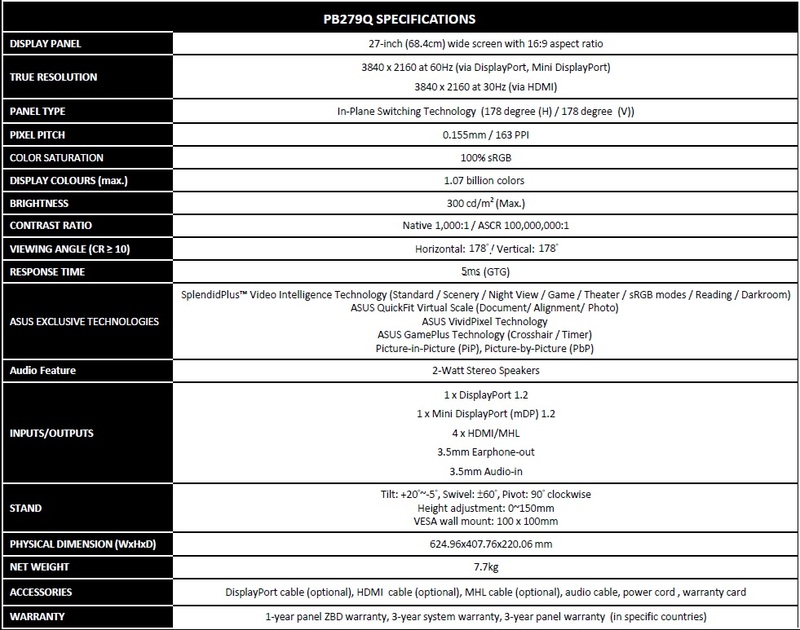 Lightness, however, isn't an attribute the UHD PB279Q posseses as it weighs in at 7.7kg.